Students may be dropped off as early as 7:30 a.m. Students who arrive before 7:30 a.m. will be enrolled in the before-care program at a cost of $5/student. Students enter the school through the main school doors. Click on the map to view details. Cars enter from Buehler Road only. Via Spartan Road. NO ENTRY FROM ROUTE 108. Cars proceed around the Worship Center and down the long driveway next to the apartments. Turn right on to the driveway between lots B & C.
When the line of traffic stops, students may exit cards anywhere in the yellow safety zone. Patrols assist students exiting cars and direct them to keep walking to the school entrance. Parents remain in cars and keep focused on traffic. DO NOT PULL OUT OF LINE TO GO AROUND CARS STILL UNLOADING STUDENTS. Help us keep the line moving as quickly as possible – if you need a longer good-bye, plan to park in Lot B (the upper side lot). Cars exit onto Route 108. Dismissal is at 3:00p.m. There are two cycles of pick-up. Students whose parents are not in the parking lot at the beginning of the second cycle of pick up will be walked to daycare. There will be a late pickup charge of $10 per child for each child in the carpool. Enter Parking Lot B. Turn right. 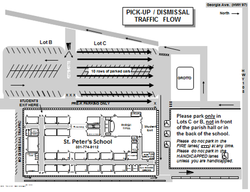 Follow traffic flow pattern down to Parking Lot C. Park in Lot C facing Grotto, in lanes 1,2,3, etc. (up to lane 10). When Lot C is filled, cars should stay lined up in traffic flow lanes in Lot B. Turn off motor and wait for children to be dismissed. Plan to stay in your car to be ready to move when signaled to exit. If you have business to conduct with a teacher or in the school building, do not move into the pickup lanes-park in Lot B in spaces facing the church. 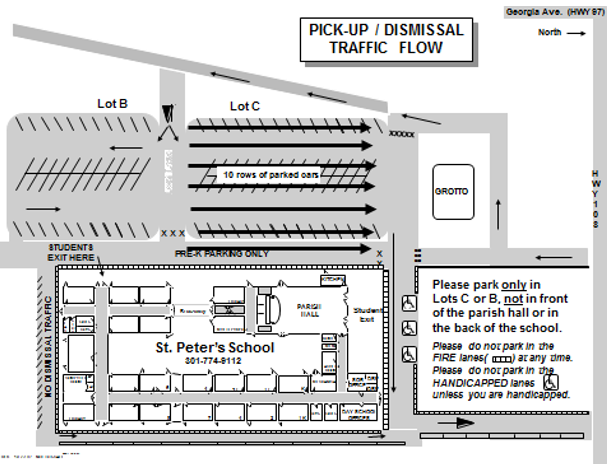 Students are dismissed in order, K- 8, from the doors in the middle school facing Lot C. Students may only enter cars parked in Lots B &C. Students will not be permitted to walk to cars on the driveway. When the hand bell rings, all pedestrian traffic must stop. Cars are dismissed in order, starting with Lane #1. Be ready to move when the lane is signaled to go. A school staff member directs this process. 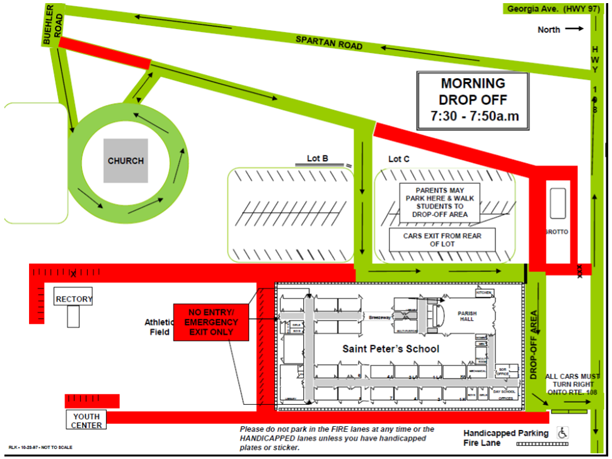 Cars in Lot B are dismissed following all cars from Lot C.
If you need to wait for a student, proceed with the traffic flow out of the parking lot, turn left at the Grotto and re-enter the traffic line back into Lot B. After all lanes have exited, the hand bell rings again and children are permitted to board cars for the second cycle of pick-up. Please do not try to move your child while cars are moving during dismissal. Wait with your child until the hand bell rings once again to signal that it is safe to walk. Afternoon dismissal is onto Route 108 ONLY (left- or right-hand turns are permitted). 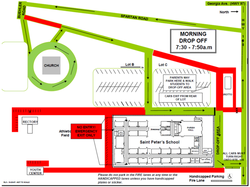 Please note: Carpools including student patrols should plan on coming for the second cycle of pick-up.